According to new discoveries from polar researchers, the crucial ice sheet of Greenland is expected to experience another record-breaking melt this year, hitting new and more dangerous limits. This ice sheet is a big focus for scientific research because its fate has significant implications for global sea levels, which are already rising as oceans warm and polar ice melts. The ice sheet of Greenland has been melting at much quicker rates than scientists predicted even just 10 years ago, triggered by changing weather patterns and warming sea and land temperatures. Since recordkeeping began in 2000, the high-elevation areas of the ice sheet have reached record low levels of snow, indicating the sheet is absorbing more energy than normal and will likely beat out the 2010 record melt season. The reflectivity of Greenland’s snow has kept Greenland cold, as incoming heat from the sun is redirected back toward space. However, when combining changing weather trends with increasing temperatures, snow and ice sheets are becoming less efficient at reflecting energy back and are creating more severe melt seasons. 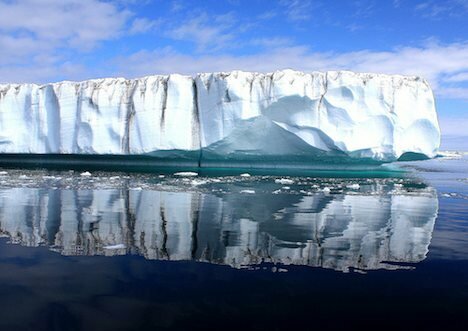 Greenland is the world’s largest island, holding 680,000 cubic miles of ice. If all of this were to melt, the oceans would rise higher than 20 feet. Thankfully, we don’t have to worry about that eventuality any time soon, but current trends do indicate that melting during this summer season could cover all of Greenland, something that has never happened before. This could pose serious risks if it becomes a yearly trend. 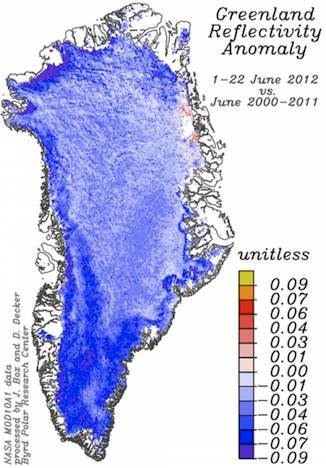 Bottom image: Satellite data of Greenland reflectivity June 1-22, 2012 versus the same periods in previous Junes back to 2000. The blue colors indicate a decrease in reflectivity compared to previous Junes. Credit: NASA/Meltfactor.org.